The potentiometric transmitter is a one-dimensional position sensor. It is based on the potentiometer, an adjustable potential divider. A voltage is applied to a resistive track. 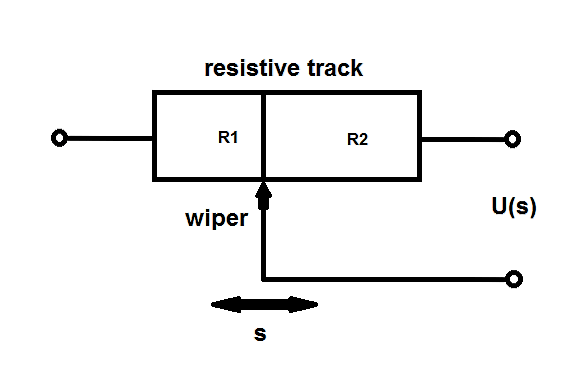 A wiper runs along this resistive track and thus divides the resistor in two parts, as shown in figure (resistor R1 and R2). The Linear Variable Differential Transformer (LVDT) is a kind of transformer which is based on induction. It can be used for relative measurement of the displacement. 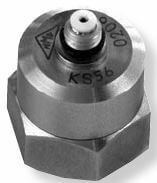 As shown in figure 2, this sensor works along one axis and it is possible to determine the direction of the motion. 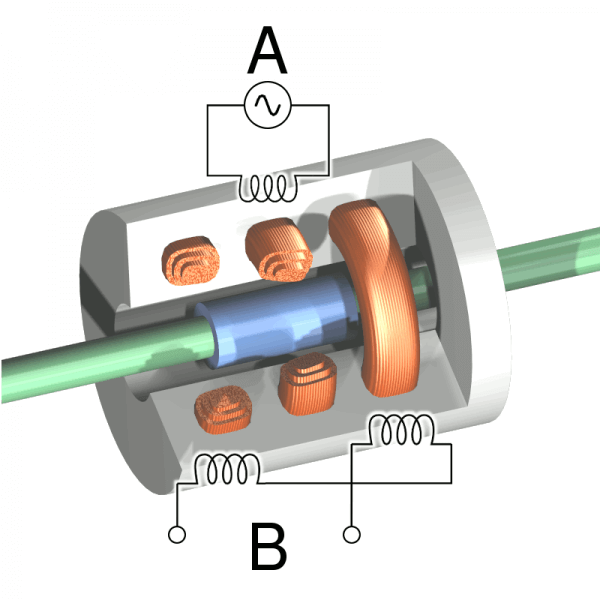 The LVDT basically consists of three coils and a core. The primary coil is connected to an AC supply for excitation. The two other coils are placed on each side of the primary coil and are arranged series-opposed. In the center of this coil assembly is a core that influences the magnetic flux from the primary to the secondary coils. Depending on the motion of the core, which is attached to the vibrating object, direction and distance can be deduced from the output signal. The principle of electrodynamics is used in a relative speed sensor. It is based on the phenomenon of induction. In order to apply this principle a coil and a light permanent magnet is used. 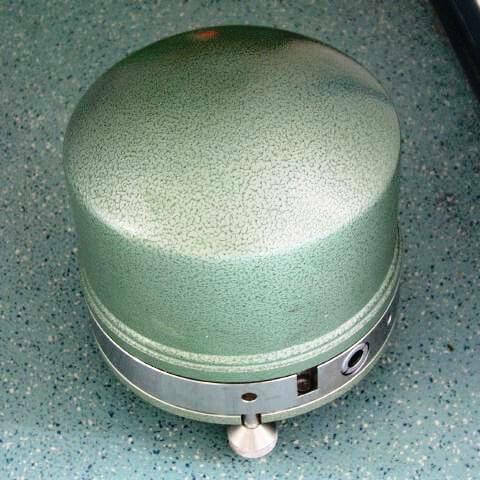 The magnet is fixed to the vibrating object. The magnet either moves contactless or it is guided within the coil. Absolute speed can be measured with the Seismometer. The Seismometer consists of a seismic mass and a spring within a housing. Due to the inertia of the mass, there is a relative movement between the seismic mass and the housing, in case of vibrations. A coil, which is fixed to the housing, can be used cause induction. Due to the movement of the mass, a voltage is induced in the coil. This voltage speed can be measured because it is proportional. Often attenuation equalization is installed in such a seismometer in order to avoid resonance peaks. In today’s seismometers the mass is fixed motionless in relation to the housing. Thus there is no voltage amplitude caused by motion of the seismic mass. However the force, that is needed to hold the mass in balance, is measured through voltage. Modern seismometers are able to register frequencies from less than 10-3 Hz up to 100 Hz. It is possible to detect movements in the range of about 1 nm and several centimetres. The principle of seismic mass can also be used in path and acceleration measurement. The piezoelectric sensor works on the basis of the seismic principle and the piezoelectric effect. Here quartz crystal and piezo ceramic replace the spring used in a Seismometer. The piezo material is fixed to the vibrating object on the one side and to the seismic mass on the other. Vibrations forces lead to strain and compression on the piezo material. The piezoelectric effect describes the occurrence of an electric charge due to the change in length of the polarised materials. This charge is proportional to the acting force and can be tapped. Since the force is a product of mass and acceleration it can be easily computed. The piezo materials are very rigid, therefore damping might be necessary. This can be achieved by adding stoppers or immersing the parts in oil. The weight of piezoelectric sensors varies from less than 1 g up to several grams. The linear frequency range of piezoelectric sensors varies from below 0.1 Hz up to 104 Hz. Thus, piezoelectric sensors allow measurements of accelerations under 1 g and up to several thousand g.
The piezo-resistive sensor uses four semiconductor strain gauges. 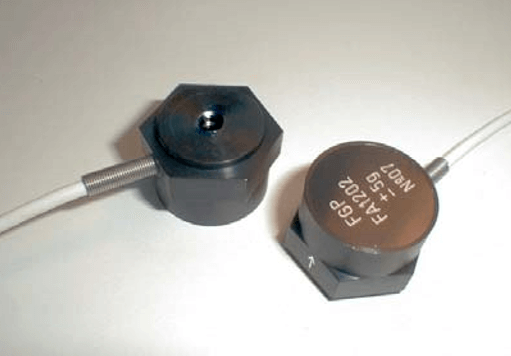 These strain gauges are mounted on the vibrating object along with a seismic mass, using a bridge-circuit. Vibrations lead to a deformation of the strain gauges. During a motion in one direction two strain gauges are stretched and the other two are compressed, which results in voltage changes. An advantage compared to the piezoelectric effect is the possibility of also measuring constant accelerations. It is possible to measure accelerations up to 1000 g. Piezoelectric sensors are more appropriate for high frequencies while semiconductor sensors are preferred at low frequencies. The functional principle of the resistive sensor is the same as the one of the piezo-resistive sensor. The only difference is that the strain gauges are not built of materials that have a piezo effect. This leads to similar properties. But the measurable signal is lower. The inductive sensor for acceleration measurement is based on the fact that the reaction force of the seismic mass can be converted into a path. Now the covered distance can be calculated through measuring the induced voltage and thus the magnitude and direction of the vibration can be ascertained. However this path-dependent measurement requires the sensor to be a lot bigger than comparable acceleration sensors.